"One Belt, One Road:" What's in It for Us? Alexander the Great is said to have declared that "logisticians are a humorless lot … they know if my campaign fails, they are the first ones I will slay." He was the one of the first strategists to understand the importance of connectivity and also to point out that there are not a lot of jokes about it. The speed and reliability of transport and other forms of communication matter greatly to economic efficiency as well as to war. Americans used to understand the importance of infrastructure. As a U.S. Army officer in World War I, Dwight Eisenhower learned how vital fast, motorized deployments could be. He became fond of pointing out that ". . . battles, campaigns, and even wars have been won or lost primarily because of logistics." Eisenhower wrote a report arguing that an efficient national road network in the United States was a military necessity. He never deviated from this belief. Finally, in 1956, as president, he signed a bill to create a 41,000-mile "National System of Interstate and Defense Highways" that would facilitate "speedy, safe transcontinental travel" as well as the evacuation of U.S. cities in the event of a nuclear attack. A few years later, when I was seventeen and thought myself immortal, I drove the same distance it had once taken the U.S. Army more than two months to traverse in just 56 hours – 2 1/4 days. Eisenhower's original rationale (and his constitutional justification) for the enormous federal investment in expressways was military. But the major benefits of the initiative were economic and political. The interstates created a huge number of jobs, integrated the nation's economy, boosted economic efficiency and competitiveness, spurred modernization and development along their routes, and provided innumerable opportunities for politicians to dispense patronage. Along with television, they progressively erased regional differences and unified the national culture. By the time the originally planned system was completed in 1992, it had transformed the economic geography of North America. China came. It saw. It learned, and built its first American-style expressway in 1990. Chinese companies have gotten very good at building roads. In 2011, the length of China's expressway network passed that of the United States. It continues to grow. At 123,000 kilometers (76,000 miles) in length, it is now by far the world's longest. In 2015 alone, China built another 11,050 kilometers (6,870 miles) of expressway. China has also gotten good at building railways. Its first high-speed rail line – meaning one that supports passenger or freight trains that travel at 200 kph (124 mph) or more – opened in 2007. At more than 20,000 kilometers (12,000 miles), China's high-speed rail lines are now by far the most extensive in the world. They have an annual ridership of over 1.1 billion passengers. All these new roads and railways in China connect to vastly expanded airports and ports. In the last five-year plan (which ended in 2015), China built 82 new airports and expanded 101 existing ones. Over 80 percent of Chinese are now within 100 kilometers (62 miles) of an airport. By the end of this decade, this percentage is to rise to nearly 90 percent. A similar wave of expansions has given China seven of the world's ten largest and busiest ports. Accompanying the explosive growth of Chinese transportation infrastructure, which includes some of the world's longest oil and gas pipelines, have been fiber optic cable and power transmission lines. Last year, China laid 2.6 million kilometers (1.6 million miles) of fiber optic cable. By the end of this year, 80 percent of Chinese broadband users will be on fiber, making China number one in the world in terms of the proportion of broadband users on mobile devices. Meanwhile, China is the first nation in the world to build a grid based on long-distance ultra-high-voltage power transmission, a technology in which it has become the global leader. China is reaping much the same benefits from this expanded infrastructure that the United States did in the last century from the combined effects of the opening of the Panama Canal and the interstate highway system. But China's gains have come in a much compressed time frame and their momentum has yet to flag. There is a logic to China's connection of internal networks to external ones and, where these don't exist, building them. Market-driven extension of China's expanding logistics system to neighboring countries and beyond had begun even before 2013, when President Xi Jinping announced his "one belt, one road" or "yidai, yilu (一带一路)" plan and slogan. Hong Kong wits aside, "one belt, one road" is a transformational concept that deserves to be treated with the utmost seriousness. Much as Eisenhower's interstate highway initiative and its echoes in Canada and Mexico integrated the North American continent, China's belt and road initiative promises to integrate the economies of the vastly larger Eurasian landmass. And it will do so not just with highways, but with railways, waterways, pipelines, fiber optic cables, power transmission lines, ports, airports, and industrial estates. If any significant part of this comes off, it will position China as the preeminently accessible society on the supercontinent with by far the greatest weight in world affairs. Unlike the interstate highway system, the rationale for China's "belt and road" initiative is economic, not military. But it obviously has enormous political and military implications. It will create a new geography for a globalized world order in which eastern and southern Asia are the economic centers of gravity. It will establish an unprecedentedly wide platform for economic cooperation, including policy coordination, trade and financing collaboration, and social and cultural interchange. For millennia before the rise of Europe and the incorporation of the Americas into an Atlantic-wide civilization, China and India dwarfed other societies in wealth and power. But they were not much connected to each other, still less to a worldwide state system. Now they will be. Not all roads will lead to Beijing. Some will lead to Delhi and other Asian capitals. It's taken an inordinately long time for Americans to notice the forces now mustered under the "one belt, one road" rubric. The first talk I gave about what ultimately became the "belt and road" initiative was to the Pacific Pension and Investment Institute in 2007.2 Since then I have spoken on the subject often, most recently in June at the Center for Naval Analyses, where I addressed the politico-military and strategic implications of the belt and road initiative.3 If you are interested, you can read most of what I've said on the subject on my website.4 I'll spare you a repetition of it. Early on, I noticed that people looked at what China proposed from very parochial perspectives. These reminded me of the famous poem by John Godfrey Saxe, "The Blind Men and the Elephant". In the United States, where we are said to stand higher and see farther than other human beings, there have been several typical reactions to the "belt and road" initiative as it has unfolded. One is denial. It can't work. For one reason or another, it will fail and American primacy will persist. Of course, "one belt, one road" might not work. China could bungle it. It could be derailed by a global financial crisis or depression, by the outbreak of war, by a political implosion in China, by foreign distaste for even a profitable Chinese presence, or by some other development. None of these scenarios is impossible to imagine, but none is inevitable. And all would be bad, not just for China, but for its neighbors, the United States, and the world. Another is fear. The Chinese are taking over. Yes, the Chinese people are making China great again. The world must learn to live with that. This conference has addressed the questions, what's in it for China, what's in it for China's landward and maritime neighbors, and what implications might it have for the global energy trade. To my nationalistic American mind, a more important question is: What's in it for us? If it's going to happen anyway, how can Americans leverage it to our advantage? Certainly, if the hidden objective of U.S. foreign policy is to implement the never-approved draft defense planning guidance of February 1992, the so-called "Wolfowitz Doctrine," then the "belt and road" initiative is indeed a direct challenge to America. That draft – brought to us by the architects of the invasion and occupation of Iraq and Afghanistan and the advocates of war with Iran and renewed containment of Russia – sought to commit the United States forever to the task of "deterring potential competitors from even aspiring to a larger regional or global role." The late Senator Edward Kennedy termed it "a call for 21st century American imperialism that no other nation can or should accept." The 1992 draft was hastily withdrawn and rewritten, but it could be argued that the imperative of holding onto U.S. primacy has nonetheless become the operative doctrine of U.S. post-Cold War foreign policy. Any aspiration for indefinite U.S. global supremacy is, of course, delusional. This is not just because of the reemergence of China as the world's largest economy, though that is part of it. China's industrial economy (as opposed to "services" like financial engineering, health care, retailing, entertainment, and the like) is already almost half-again larger than that of the United States. The European Union's industrial production is about 1 1/3 times ours. Japan's manufacturing sector is about two-fifths the size of that here in the United States, Brazil's one-fifth, and India's one-ninth, but gaining. America is still a very large factor in global manufacturing but we are no longer either dominant or even remotely self-sufficient. In purchasing-power-parity terms, China supposedly overtook the U.S. as the world's largest economy a few years ago. I'm not sure what that means. It has always seemed to me that production is more empowering than consumption and that what matters most is what you make and how much of it, not how much of your own currency you have to pay for it. But the trend lines are clear. America bestrides the world but it no longer does so as a unique colossus. Others are rising to rival the United States. Let's assume that instead of Americans' exhausting ourselves in resistance to inevitable shifts in the balances of global power and prestige, we gracefully yield to the inevitable and seek to profit from it. How can we mitigate any negative effects of China's connection of itself to Europe and the rest of Eurasia? How can we maximize benefit from this? Others have spent the past day and a half masterfully describing and analyzing the details of "one belt, one road." But let me retreat to high altitude and summarize it briefly. The "belt and road" initiative amounts to a proposal to unite the Eurasian landmass under common rules and transport regulations. Beijing seeks to improve the efficiency of customs clearance, enable interoperability across different rail gauges, reduce tariff barriers, assure security along transport corridors, and harmonize institutional, financial, and regulatory structures. It envisages bilateral agreements with sixty-five countries to reduce impediments to trade, the creation and endowment of new financial institutions, and the execution of enormous infrastructure projects. At least 890 projects for new roads, high-speed railways (50,000 miles of them! ), pipelines, ports, airports, and inland telecommunications links are to boost the efficiency of overland travel and economic transactions across Eurasia. The vast space from the Atlantic to the Pacific and from the Pacific to the Middle East and the Indian Ocean is to be laced with industrial development corridors and special economic zones that draw on these links to create centers of economic activity. Network effects assure benefits not just to China as the initiative's leader but to every country touched by it. In the aggregate, China's "belt and road" initiative constitutes the largest and potentially the most transformative engineering effort in human history. At $1.4 trillion, China's stated financial commitment to these projects is eleven times the size of the Marshall Plan, restated in current dollars. Leveraging will likely at least triple the value of this proposed investment between now and 2049. Most projects will be overland – Kunming to Singapore and, separately, to Kolkata; Kashi [Kashgar] to Gwadar, and, separately to both Tashkent and Tehran; Xi'an to Istanbul and to Moscow, Rotterdam, and Lisbon. Relatively few projects will be maritime, but, given the scale of the initiative, these too will be transformative. 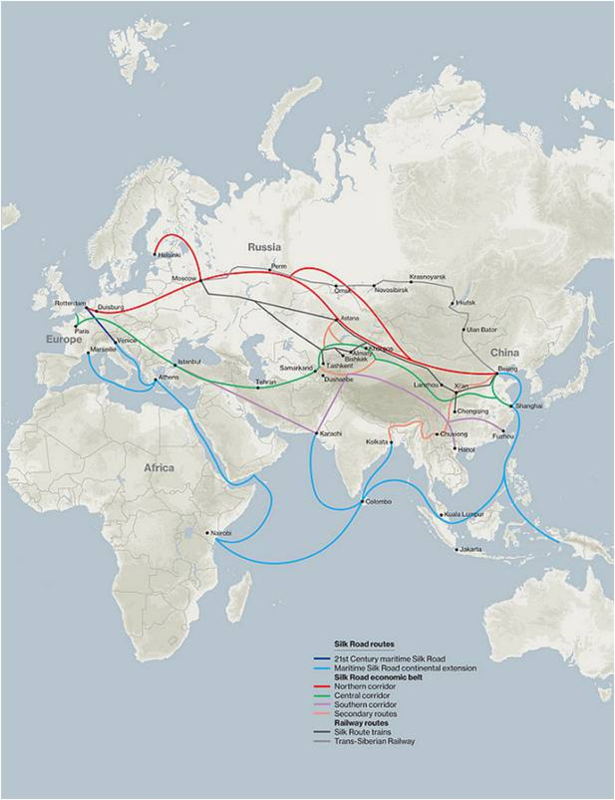 China has set a goal of $2.5 trillion in trade with Silk Road countries by 2025. In support of this, Beijing is encouraging mergers, acquisitions, and green-field investments to create what might be called "multinational companies with Chinese characteristics," some with headquarters in Europe or elsewhere outside China. The current surge of Chinese merger and acquisition activity in the EU – much of it involving the German Mittelstand – reflects this objective as well as a desire to upgrade Chinese technology and penetrate new markets. Despite nationalist resistance, as the "one belt, one road" concept is implemented, the EU and China should draw ever-closer commercially. The same, for other reasons, is true of China and Russia, and of China and Iran. In 2015, services overtook manufacturing and construction as economic activities in China. They now contribute over half of Chinese GDP, up from less than one-third ten years ago. Chinese consumption overtook investment as the main driver of growth in 2011. While it remains relatively low as a percentage of China's GDP, continuing rapid urbanization and the concomitant growth of China's middle class promise to correct this. Fifty-six point six percent of Chinese (800 million people) now live in cities, up from less than 20 percent in 1980. According to the OECD, China is on its way to a 69 percent urban population by 2030. City dwellers are heavy consumers. This is the digital age. China is already the world's largest online marketplace. As the Chinese economy evolves, we are seeing massive growth in China's cross-border capital flows. The value of Chinese overseas acquisitions announced in the first nine months of this year was about $191 billion, almost double inflows of foreign investment into China in that period. (Over the same timeframe, foreign nations rebuffed $40 billion in Chinese acquisitions.) The majority of officially sanctioned capital outflows will go into investments under the "one belt, one road" rubric. China's evermore important global financial role will be decisively shaped by its experience with Eurasian economic integration. The "one belt, one road" initiative is partly a short-term measure to alleviate overcapacity in China's cement, steel and aluminum industries by conjuring up export markets for them. It will let Chinese manufacturing and construction companies continue for a while to do the sort of work abroad that is winding down at home. The initiative is also a way of developing Xinjiang and other parts of western China by making them key connectors to Europe and the Middle East through Central Asia and Russia. But, in the longer term, "one belt, one road" is a strategy to use Chinese resources to tie Europe and Asia more closely to each other and to China. The added efficiencies of its planned railways, waterways, highways, pipelines, power grids, fiber optic cables, and air and sea ports respond to real market requirements and opportunities. Its institutional linkages will facilitate the investment necessary to realize these efficiencies. The bureaucratic and unified combatant command structures of our government predispose Americans to see these projects in terms of Chinese outreach to Central or Southeast Asia. But their objective is above all to tie Europe to China. As China becomes the world's largest socioeconomic entity, it seeks to connect itself to the world's second largest – Europe – via Russia, Central Asia, the Middle East, and South and Southeast Asia. Of course, reaching for Europe from China by land or sea entails building closer ties with neighbors and intermediate countries. These parts of the "elephant" are certainly large and important. But they are far from the whole. China has created an imposing array of international financial institutions to fund its ambitions. They include the Asian Infrastructure Investment Bank (AIIB), the New (BRICS) Development Bank, the Silk Road Fund, the Marine Silk Road Investment Management Fund, and the Maritime Silk Road Bank. These banks and funds address well-documented investment shortfalls. The U.S. reaction to them has nevertheless been peevishly standoffish. Turning our back on these Chinese-sponsored institutions just means that Americans have no voice in them, cannot help shape them, may be the last to become aware of the projects they finance, and will not share in the profits of these projects. Fortunately, contrary to expectations, China has pretty much stuck to the rules of the pre-existing financial order, with the welcome exception that, unlike the World Bank and the Asian Development Bank, the newly created financial institutions will accept bids on projects from companies in non-member countries. The new development banks are also co-financing projects with the legacy ones. These are elements of openness that American companies and export finance agencies need to exploit, as Japanese companies already are doing. Alone among U.S. allies, Japan has followed the U.S. example of boycotting the new, Chinese-sponsored institutions. It has never been clear what we and the Japanese hope to gain by refusing to accept and participate in them. The answer so far has been nothing but lost opportunities for our companies' exports of goods and services. Of course, to join these banks or funds, we'd have to invest in them. And, embarrassingly, thanks to the sequester and ongoing political gridlock in Washington, the United States has neither the diplomatic agility nor the money to do so. Americans are not in the game. And, if you're not in the game, you can't score. If we're serious about rebalancing our attention to Asia, we need to get involved in the new institutions Chinese and other Asians are creating. The next administration need not feel bound by the mistakes of this one on this or other policy issues relating to China or its "belt and road" initiative. I should note that a growing number of countries contemplate setting up bilateral investment funds with China to finance belt-and-road-related projects. The United Arab Emirates led the way last year, when it established a $10 billion joint strategic investment fund between Mubadala, China Development Bank, and the Chinese State Administration of Foreign Exchange. France is the latest to set up such a fund. Broad bilateral agreements on project development have been signed between China and Hungary, Mongolia, Pakistan, Russia, Tajikistan, and Turkey, among others. But these umbrella agreements distract attention from the astonishingly complex fabric of arrangements for cooperation on specific projects that are being worked out between Chinese entities and foreign counterparts. Some American companies have found a place in these. The U.S. government should do what it can to ensure that more U.S. companies have a shot at this sort of business, which is growing rapidly. Some of the projects under the "belt and road" initiative antedate it, and -- not unexpectedly -- some of these are politicized. Infrastructure project proposals provide the parties with leverage over each other even as they offer incentives to solve disputes. One thinks of Kyrgyzstan's foot-dragging on letting China build a railway through its troubled Uzbek-majority regions to its border with Uzbekistan, where a new, Chinese-built railway to Tashkent is already in place. Projects can also raise difficult domestic patronage issues for governments, as evidenced in the difficulties Singapore and Malaysia are having in fixing a route for the high-speed rail line from Kunming. Or they require the issuance of local debt, commonly in Renminbi bonds, that tests the credit worthiness of local governments, like Laos and, for different reasons, Thailand. Washington would do well to stay out of these tempests in the Chinese export teapot and let Beijing and those directly concerned deal with them. But U.S. companies should be encouraged to participate once political obstacles have been removed and projects can move forward. Other countries would welcome American participation, not just for its economic and commercial advantages, but because it would dilute Chinese dominance of them. And China appears open to this. A few projects, like the belt-and-road-sponsored development of the Russian port of Zarubino, have obvious direct implications for U.S. interests. Zarubino is a $3 billion railway and port-building project to connect Jilin Province to the Russia's coast on the Sea of Japan just north of its short border with Korea. It will save China two days' shipping time across the Pacific to the U.S. West Coast or to Europe or the U.S. East Coast via newly opened Arctic shipping routes. It will also facilitate a constant Chinese shipping presence in the Arctic, to the north of Alaska, Canada, and Russia. And it will provide a welcome alternative to previous Chinese plans to accomplish the same things through development of the north Korean port of Rajin. But it is the impact of the whole, rather than specific projects, that is most consequential both economically and politically. Japan has announced its own $110 billion infrastructure investment fund for Asia and India is committed to invest $500 million in the Iranian port of Chabahar as part of its effort to build connectivity to Central Asia and Russia. The justification for these new funds is, in part, geopolitical rivalry with China. But they will complement and support rather than undermine the Chinese objective of strengthening pan-Eurasian economic ties. China seems confident that, if Eurasian trade and investment flows are facilitated by others as well as itself, its economic size and dynamism will make it a major beneficiary of the results. The East Asian economy is already in many respects Sino-centric. Beijing's expectation is that as its ties to Europe, Russia, and the Middle East mature, Eurasia will become evermore Sino-centric too. In short, to the extent the "belt and road" initiative works, over time China seems likely to emerge as the natural focal point of a vast, loosely integrated, economically dynamic Eurasia. This region already has 55 percent of world GNP, 70 percent of global population, and 75 percent of known energy reserves. Its share in the global economy is expanding. This means that China is inevitably going to have an ever-larger role in rule-making not just in the Asia-Pacific (a prospect which TPP ineptly targeted), but globally. And growing ties to China will make its partners want to avoid offending Beijing on matters that do not directly touch their own national interests. As a contemporary example, the burgeoning Greek and Hungarian relationships with China through the "belt and road" initiative had a good deal to do with the EU's decision to keep its distance from the contentious July 2016 award in the Philippines-initiated arbitration of South China Sea issues. China's growing influence is a very good reason to seek a seat alongside it in both the new and old councils of the emerging multipolar world rather that to continue futilely to try to exclude it. The United States should be part of the drive to improve global connectivity. Sunzi declared that "the line between disorder and order lies in logistics…" That's what's being discussed by China and other parties in the absence of America. And we all know that, if you're not at the table, you're on the menu. Part of "one belt, one road" is working out common standards and program guidelines to facilitate transnational cooperation. The United States needs to participate in this process. There are many missing elements and details to be worked out for cooperation among countries under the "belt and road" initiative. The United States needs to be constructive and helpful, not negative and critical, still less obstructive, as all this unfolds. Americans have a big stake in how Eurasia integrates and in what its relationships with other continents and regions become. Time to get in the game. Time to participate in crafting the post-Pax Americana order. Time to leverage China's initiative to American advantage.